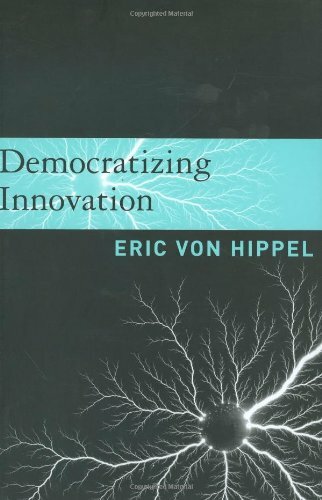 On the book Democratizing Innovation, Eric von Hippel explains all utilization of users for developing innovative products by carefully explains all the aspect related to this concept. Throughout the book we can find the same examples coming over to explain different aspects, but don’t get me wrong there are multiple example that contribute to his theory. Each chapter of the book is dedicated to one aspect; the transition from one chapter to another is smooth and provides a consistent way for understanding the theory. In first chapters of the book, von Hippel concentrates on the development of lead user and the impact they have over the manufacturers. He justifies the need of users for the development of innovative product by explaining the problem of sticky information and the cost associated on it. In the last chapters of the book, there is more a concentration on defending the need of this type of innovation. We can notice the dislike toward certain policies in the some chapters, and how some scholars have misunderstood the concept of his theory. He justifies his theory without criticizing other and in the final chapter he links his theory with other in other fields (e.g., nations competitive advantages, social construction of technology). The book is easy to read and to understand. It provides a look on the way that innovation can be democratize so that users can be part of the innovation theory. This book can serve as an introductory book on the subject or as a literature review to see different aspect of the theory. This chapter covers the literature that contributes to the innovation that is created by users. Von Hippel provided empirical prove that shows the correlation that exist between lead users and innovation developed by users. He also shows how innovation done by these lead users has higher probability of success in the market. He brings 4 examples from the extended literature on this subject to prove his point. In the final part of the chapter he wonders why are there not more lead users in the studies, the studies focus on identifying the lead users form the sample they take but not on identifying lead users to do the sample. He finds that there might be a difference between global lead users and local lead users. The local lead users might find it better to innovate than to look for solution created by other in the global context. This difference between global and local lead users can be future direction for the literature in lead users. The heterogeneity between the needs of the customers is the most important factor that leads users to innovate. Heterogeneity has been treated in different aspects and the most common way is to create cluster of similar needs. With this the manufacturers can benefit from the economy of scale. The chapter focuses on providing evidence from previous studies on how high heterogeneity need between users cause them to innovate, so that they can adapt the product to their own needs. Von Hippel recalls the study made on web master that use Apache, and how their level of heterogeneity was high, how the level of satisfaction increase between those users that modified the software to meet their needs and how those that were not able to modified, because of lack of skill, were willing to pay for the modification. The decision to innovate or to buy the solution is analyzed in this chapter by the concept of transaction cost. How much it cost the user to develop the solution compare to the cost of ordering a custom product. There are many reasons that the manufacturer can increase the cost of creating a custom solution for a specific user. Maybe the need of the users requires high quality on an aspect of the product and lower quality on other aspect, but for the manufacturer doing this wouldn’t be acceptable because it would reduce the overall quality of the product and affect the image of the manufacturer. Solutions that the user can come might not be appropriate for the manufacturer because any damage that the product can cause would fall under the responsibility of the manufacturer in case of buying the solution. This would increase the price of the solution. Also the manufacturer has to pass a set of procedure to test and assure that the product being deliver satisfy local regulation, this not only increase the overall price of the solution but also increase the time of delivering the final solution that will also increase the price for the user. At the end of the chapter von Hippel show a calculation on how to determine when is useful for the user to innovate or to buy, in case that the need is only for one customer then the user should innovate, in the case of many users having the same need then the manufacturer should provide a solution. When the need is only of few users then there would be an over investment in innovation because for the manufacturer is not feasible to provide a solution but the users will have to invest the cost of innovation for all of them to come with the solution. The final part of the chapter explains how some users would choose to innovate because they seek the thrill of problem solving. The cost of transferring information can be perceived from different perspective. The more difficult and costly that it is to transfer information the more sticky the information is. Manufacturers need to understand users-needs so that they can provide a solution for it, for them is not so easy because they user might not provide all the information needed because he might think is not important. Many studies have shown the cost that transferring information has when projects are being implemented. In this chapter von Hippel shows the importance that information transferring has, and how this affects the proper development of any project. From the finding of many studies, von Hippel shows that need-intensive task are normally created by users where solution-intensive task are created by manufacturers, this is because the users has all the relevant information needed to develop a need intensive task and the manufacturer has the experience and knowledge of providing solution intensive tasks. At the end of the chapter von Hippel shows how industry that have users with heterogeneous needs tend to have user innovations to lead the field, and how the create solution for their needs with the knowledge that they already have from their hobbies, work or other. They normally do not get new knowledge to provide their solution but use the knowledge they already have. At the beginning of the chapter the impotence for users to learn by doing is discus and how trial and error can help the development of new products. After explaining the process of designing by using trial and error he moves to the stickiness of information. The point of explaining the trial and errors is for (1) showing how information is gather by doing this and showing the ways that users can get information that would be difficult later to transfer to other and (2) to justify the importance of this characteristics later when he explain the important aspects that toolkits should possess. The chapter shows that revealing the innovation has been done from long time in history. In this chapter von Hippel shows different studies that analyzed different industries in the past and how they revealed their new creations. This goes against the theory on private investment model. Von Hippel shows how both the private investment model and the collective action model can be combined to explain the reasons why individuals reveal their innovations. With the combination of both model von Hippel creates the private-collective model where he propose that under common condition free revealing of proprietary innovation may increase rather than decrease innovators’ private profit and contributors to a public good can inherently obtain greater private benefits than free riders. Revealing innovation has been done in different industries and has shown to be sustainable. The open source movement has lived from this assumption and so has the academia. In this chapter von Hippel explain the raise of open source and two important projects that were created with this method. He then shows some studies that have focus on the development of physical good with the method of innovation communities and how the users have benefit. He concludes the chapter by showing another way that innovation communities benefit other users by providing support to each other. As explain in previous chapter manufacturers need the information of their customer to create the products that they need. When a product is created the one that knows the most about their customer need in the moment of design has higher probability of succeeding in the market. If the users is able to innovate then the success of the products is higher. For platform based products it has been shown how firms have been able to have stronger benefits when the components created by the users are shared. The policy that exist now protects the intellectual property so that other can’t imitate and allows the original creator to benefit from their innovation, with this the policy maker believe that more incentive to innovate exist. The problem is that the way that patent are being used are also preventing the development of innovation. Patents prevent the usage of it by other but do not secure the usage by the creator, so the creator can use its patents to prevent further development on that area. Future law may also have impact on preventing the innovation by users and in this chapter von Hippel critic certain laws (e.g. Digital Millennium Copyright Act) and the elimination of network neutrality. We can also feel a dislike towards the way that patents are used. Von Hippel finalize the chapter by criticizing the way that manufacturers are being given R&D incentive, and argue that by using users innovation could be a better way for incenting the R&D in those firms. After explaining the importance of user innovation for the development of new products von Hippel explains what roles manufacturers can take in the new innovation system that is user centered. He propose that manufacturers can become producers of user developed innovation and sell them so that other can benefit. As an example he mention the development of the kite surfing industry and how a company was able to do this, significantly reducing the price of the kites, improving the quality and reducing its internal cost by exclusively relaying on the user development. These users’ developments also secured their products success. Another role that he proposes is for manufacturers to become product platforms and provide tools so that the users can easily create their innovation on top of the platform provided by the manufacturer. Some companies has created this and have expanded the value of their products by incorporating solutions provided by the users. The statistical software industry and the game industry have benefited from this, and von Hippel shows examples to support his argument. The last role provided is to become sellers of products and services that can complement the user developed innovation. Selling services that support the user innovation is one of the main business models of open source software. Not all manufactures will have benefits from applying any of these roles or combinations of then, sometime manufactures could have their image affected by these changes and they can also have some legal problem from users’ modification. The practical approach on how to target lead users for the new product development is discus in this chapter. Von Hippel shows how contacting lead users through reference of other lead users can be a way of using them for the development of new products. Also manufacturers can user online medium to gather a community of lead users. The chapter illustrates different studies that utilize lead user for the development of their products and focus on a study conducted by him and other colleges in 1999. They focus on the product development of 3M, they compared the success and sell forecast (among other things) of products that were developed by traditional means and those developed with the utilization of lead users. Von Hippel demonstrates the success that the products developed with lead users had over those developed without lead user. The conclusion of this chapter argues the misconception that Christensen and the researchers on disruptive innovation have over the research of lead users. Christensen argues that lead user innovation cant lead to disruptive innovation and only to sustainable innovation since they listen to much to their customer. On the other hand, von Hippel explains that lead users are not customers, but people that are ahead of the need of the mass, and that the utilization of lead users doesn’t support the idea of using the customer as a mean of gathering data for the future development of products. Von Hippel concludes by showing how lead users have created disruptive innovation and how these users are not concern on the market but on their own needs. The creation of toolkits to allow users to easily develop innovative products is a tool that manufacturers can apply to provide a greater freedom to their customer to innovate. The advantage of creating this tool is that the manufacturer can make innovation cheaper and quicker for the users and in this way increase the amount of innovation that users can do. The toolkit will integrate a set of product design, prototyping and design testing tools so that the end users can utilize for their innovation. In this chapter von Hippel, cover the different advantages that having providing toolkits give and the important attributes to make the toolkits successful.